Hi everyone, sorry about no post yesterday like I said on thursday I have been down to england visiting family and got home today after a wonderful day and a half down there with my lovely grandma and my grandma and grandad as well. so over my time down there I have decided that im not going to be blogging christmas eve or christmas day as on christmas eve i'm actully at work then its family fun time so I dont really want to blog that day and christmas day there is really no need to explane that but you know, I will be takeing pictures of my christmas like I did last year though. any way its after today I only have 8 more blogmases for you, crazy the time is going to fast its unreal, but I have a busy week ahead so its going to be christmas before we know it. 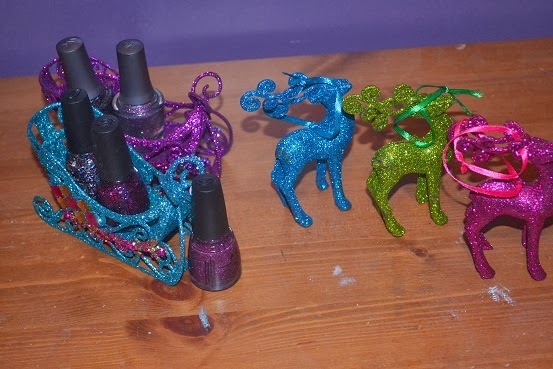 Todays post is my nail polish loves for christmas. 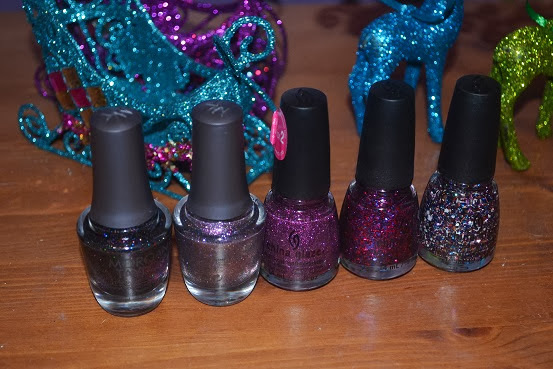 this christmas i'm so into glitter its unreal and what else is unreal is I have actully just bought these 5 polishes in the past week and a half. 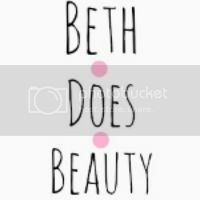 so I have two makes of nail polish in this post and there both avalable at sallys. we have some china glaze and some morgan taylor. starting from the top of the wheel. Your Present Required- this is a glitter packed clear nail polish with a mix of white blue and purple chuncky glitter. the white glitter looks like snow so I really love that. Be Merry Be Bright- this again is a glitter packed clear polish with a mix of smalish purple and pink glitters, its very pretty. Put a Bow on it- this is so pretty it needs 2-3 coats to get glitter delishios nails, im debating over this one and the next colour for tusday. New York state of mind- this polish is amazing its just amazing its black with a tone of multy colour glitters in it its amazing and so pigmented with 2 coats. 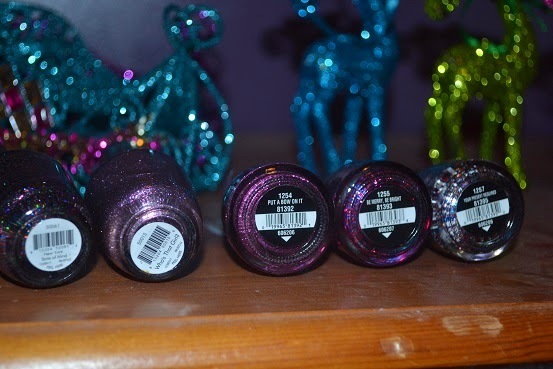 Whos that girl- thi is a purple glitter polish its very christmasy and lovely with just 2 coats its a beauty. 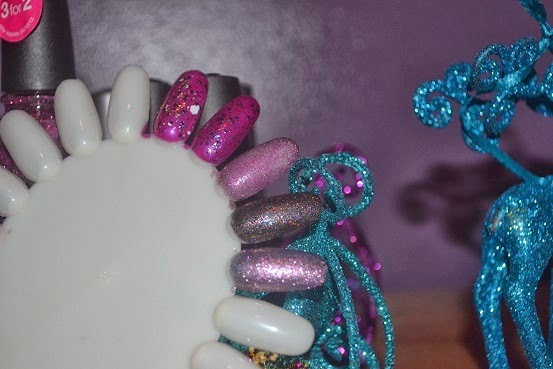 so thats the nail polishes im showing you again, I have a few posts in mind but would love some suggestions. also please let me know if you want to see a what i got for christmas post and a what i got in my stocking post?